Labrinth, Sia, & Diplo Present LSD is the debut studio album by LSD, released 2019 RECORDS from Columbia Records on April 12, 2019. This is a project that you can only really embrace in small doses. More than anything, this album is both tired and wired, like drinking Red Bull after a fifth Red Bull. Not even a Lil Wayne remix can yank it to life. The album’s mix of tropical vibes and experimental hooks give LSD a pleasant, lush, varied landscape of tones and tempos. LSD underwhelms, even if you accept that three of the world’s most interesting musicians would always struggle to create something greater than the sum of its parts. The innovation you’d expect from a project like this is sadly lacking. While the songs aren’t top-shelf Sia, for a session that comes across more like an arcade game than a coherent album, that’s fine. Most of the songs have already been released as singles or in an EP, which gives the LP a secondary feel. It sounds like a load of ideas have been thrown together without many songs at their core. We should probably make the most of “LSD” and not hold our collective breath for the follow-up. It’s pretty unbeatable pop music and will hit the high streaming numbers it deserves. No one seems to have stepped in and been the adult in the control room. It might be time to drop LSD if this keeps up. The way glassy synthetic sounds, freaky processed voices and swelling string sounds flow in and out of one another really rewards close listening. 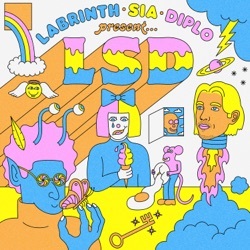 There are few surprises on ‘Labrinth, Sia, Diplo Present… LSD’, not least because majority of these songs have been out for ages already. Wow! Still making supergroups are we? I was just a fan of Sia and stumbled onto this purely by accident. Whoa, I am now a fan of Labrinth and I was briefly aquainted with Diplo, as he did a project with RJD2 awhile back. I am basing my review off of the 5 sneak preview tracks. This is smooth madness. Very chill with some savory grooves and whatever Sia touches is ridiculously good. I pre-ordered and the first 5 are on heavy rotation already. Keep it up! Outstanding Album Each piece of music in the album so far is incredibly catchy and beautiful. How it all mixes into peace and love and overall earcandy. I totally recommend pre-ordering this, especially hearing a snip-it of "Heaven Can Wait". Great teamwork is psuhed through each piece of music. Including my favorite mountains, which brought me through a rough christmas season. Way to go Labyrinth, Diplo, and Sia!